Parts for all full size Gas Scooters and Electric Scooters. Stock and Performance parts for all brands of gas and electric scooters. All Chinese brands, Razor, Schwinn, Currie, GT, Mongoose, Bladez, Xtreme, Roketa, Sunl, Boreem, Electra and many more. 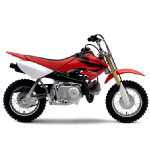 Stock and performance parts for Dirt Bikes and Pit Bikes with the 49cc, 70cc, 90cc, 100cc, 110cc or 125cc 4-stroke horizontal cylinder engine. These parts share a similar design to Honda XR and CRF Dirt Bikes and engines. 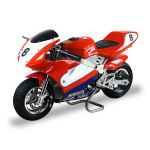 Stock and performance parts for 2-stroke and 4-stroke pocket bikes, mid-bikes, super pocket bikes, Pocket Quads, Mini-Choppers and Electric Pocket Bikes. Models include Cagllari, Cat-Eye, X1, X2, X7, X8, X12, X15, X18, X19. Engine displacements are 47cc, 49cc, 50cc, 70cc, 90cc, 100cc, 110cc and 125cc. Stock Parts, Performance Parts and Accessories for all types and styles of Chinese made ATV and Quads. Parts are categorized by engine size, engine type and vehicle class. Batteries for all types of scooters. Scooter battery. Scooter batteries. Drive Belts for Scooters. Scooter Drive Belts. Scooter Belts. Scooter chains. Chains for scooters. Motor scooter chains. Tires and Tubes for Scooters. Scooter Tires. Scooter Tubes. Lights for Scooters. Scooter Lights. Motor Scooter Lights. Spark plugs for scooters. Scooter spark plugs. Scooter spark plug. All sorts of cables for scooters.